We're the behaviour change experts, co-designing award winning communications, services and products that create health, wealth and wellbeing. We blend marketing know-how with creative and digital communications, to create leading behaviour change solutions. We deliver award-winning, insight-driven strategies and campaigns that bring tangible changes in behaviour. How written communication can work for today’s marketer. Hitch Marketing have been working with Greater Manchester Health and Social Care Partnership (GMHSCP) to deliver a major new campaign to encourage smokers across Greater Manchester to quit. The campaign launched on National No Smoking Day (13 March) and aims to help tens of thousands more Greater Manchester smokers to quit. 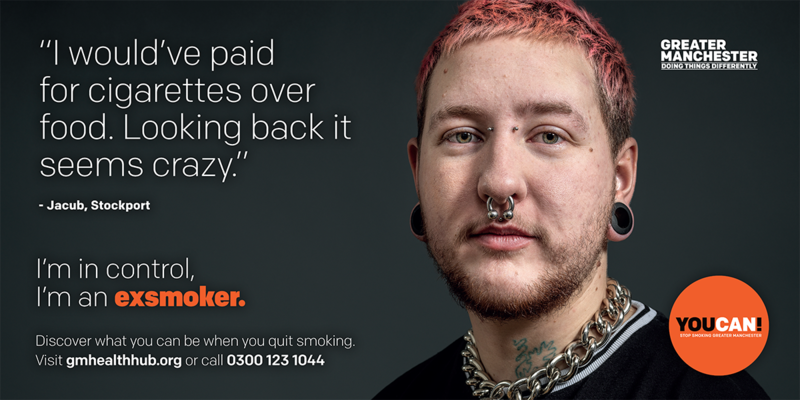 The new ‘ex-smoker’ campaign centres on the real life experiences of former smokers from across Greater Manchester, providing a positive message that you can stop smoking. While reminding smokers of the serious health impacts of tobacco, the focus is more on the personal benefits of quitting, as experienced by these local residents. The brand concept ‘You Can’ will unite all quit marketing communications activity over the next 2-3 years to ensure a consistent look and feel is communicated to residents. The concept aims to empower residents and was based on a detailed review and understanding of audience segments. Real ‘ex-smokers’ and accompanying messages have been chosen that resonate with the audience segments, all who want to quit smoking. Insight has been used to develop messaging that resonates with smokers under the age of 30. Messages focus on immediate benefits of quitting, including feeling healthy and being more in control. Hitch Marketing lead on the Strategy, Creative, Photography and deliver of OOH campaign activity. Koala has led on the TV and Radio adverts. The mass media campaign features advertising on ITV Granada, Sky Adsmart and video on demand services; commercial local radio, social media, online, local news media, and on outdoor display locations across Greater Manchester and will run for 6 weeks. Jude Hackett, Campaign Strategy Director from Hitch Marketing, said: “This fully integrated marketing campaign has allowed us to reframe the quit process in a positive way. We want to invite smokers to discover what they can be when they quit smoking. It’s been a fantastic opportunity to work with an ambitious client to help people quit smoking and save more lives across Greater Manchester." That is a direct quote from my mum that followed me around for my pre-teen and adolescent years. I’ve since rediscovered it as my children have grown older and I find myself recycling those phrases that I said I would never use. Whether I actually intended to convey the tone that my mum implied in her response is a moot point but reliving the phrase got me thinking, how good are we, as humans, at actually reading the emotions behind the words and phrases we use? There’s a saying that ‘communication is the response you get’. When we are face-to-face with colleagues, family or friends we can see the response our communication gets. We see the slight lowering of the eyebrows when they are confused and we respond, re-phrasing what we say to lessen this confusion. Or we see their eyebrows raise, a slight upturn in the corners of the mouth and a wrinkling of the forehead when the penny drops or the light bulb appears over their head. Reading people’s emotions generally works pretty well in these situations. But we now live in an age of text communication the like of which has never been experienced before. For example, a colleague of mine recently purchased themselves a new iPhone X. After showing me face recognition and animojis he then explained to me that he’d been quite shocked one Saturday morning when one of his friends rang him up! His thought process went like this: “What are you doing! ?”; followed by “Just message me like normal people do!”. My colleague’s expectation that communication should, in the first instance, be conducted via the typed word made me think about communication generally and how it has changed and then, of course, my working head woke up and I began to think of it in a job perspective. But how can we trust that we can analyse and measure, not just what people said, but the way that they said it, when all we have are words on a page, or a Tweet or an email or an open-ended survey question? And, why does it matter? Well, approximately 11 million bits of information hit our brains at any moment. And our poor brains can only consciously process around 7 (+ or -2) pieces of that information in any one moment. That means that around 99.99% of our brain processes occur unconsciously… AND … we make around 10,000 decisions per day. Our brains usually run on autopilot, despite making us believe we know what we are doing. What’s making our decisions? Well, it has been estimated that between 80-95% of consumer decisions are driven by emotions*. If that’s the case, then 8-9,500 of our 10,000 daily decisions are being driven by emotion. So, we can see why understanding the emotional drivers and barriers is important. But it is notoriously difficult and even more difficult to do quickly with large amounts of qualitative data. By using state of the art Emotion Analytics artificial intelligence software, qualitative data is turned into evidenced, actionable insights, quantifying the individual emotions expressed along with qualitative topic analysis. We, at Hitch, have developed a package that marries Emotion Analytics with tried and tested research approaches, to deliver insight to help develop policy and evaluate strategy, campaigns, brands or just capture how people feel. But don’t think this is just for the Big Boys. Sure we can think about large scale tracking studies or specifically designed surveys but we can also think about the amount of data we all get from our Twitter feeds, or emails to our customer service teams, posts to our Facebook pages or in-situ interviews. All this can be used to understand how people are feeling and what it is that is actually making them feel that way. Highly motivated, creative individuals working with a range of associates and strategic partners to deliver innovative and co-designed solutions. The Hitch team have specialisms in social marketing strategy, market research, communications, creative and digital delivering leading brand and social change initiatives.